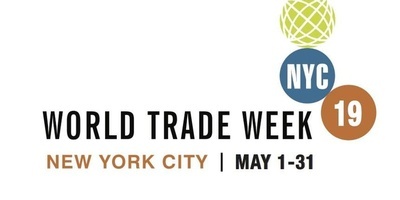 We are a partner of the World Trade Week NYC, which is an active network of more than 40 organizations in the New York metro region working together to underscore the importance of international trade, logistics and port operations to the region’s economy and to use their collective expertise to help the region’s businesses grow through international trade. The International Trade Awards Breakfast & Expo offers a unique chance to recognize the achievements of practitioners in field and facilitate the promotion of small businesses around the world. This event recognizes the importance of international trade to the growth of the region's economy and celebrates the companies and organizations that contribute to it. During the Expo, attendees will have the opportunity to network and learn of the global initiatives and resources available in the New York metro area. At the Awards Breakfast, companies will have the chance to share knowledge, resources and ideas to facilitate small business success internationally. The Awards Breakfast is the main event of WTW, offering a dynamic array of networking opportunities with State, local, federal government agencies, international trade organizations, chambers of commerce, foreign trade commissioners, libraries, and educational institutions. This event puts businesses and organizations in touch with invaluable opportunities and resources.